Many thanks to the good folks at Kregel for this review copy! Kregel continues to provide very helpful volumes on the many avenues of studying Greek—the various reader’s lexica (NT [Burer and Miller], Apostolic Fathers [Wallace], LXX [Jobes]), textual criticism (Philip Comfort’s A Commentary on the Manuscripts and Text of the New Testament), and now syntax of the GNT—enter the new volume by Charles Lee Irons. I’d be lying if I said I didn’t appreciate that this volume measures up identically to Comfort’s volume. Aesthetical considerations are always important to me—who among us doesn’t appreciate the visual bliss of seeing the Loeb Classical Library series arranged just so? However, as I’ve noted before, it’s what’s on the inside that makes most books worth your investment, so on to the content. Irons states that the primary purpose of this book, obviously deduced from the title, is to “assist readers of the Greek New Testament by providing brief explanations of intermediate and advanced syntactical features of the Greek text” (7). He further states that this volume doesn’t merely duplicate other works, such as the aforementioned reader’s lexicon by Burer and Miller or the reader’s edition of the GNT (those by Zondervan and DBG), but rather to build upon them. The goal is to help readers “make sense of the Greek text at a level of linguistic communication one step higher than the word to the syntactical level of the phrase, clause, or sentence” (7). All of this is geared toward the ultimate goal of facilitating the regular reading of the Greek text, which in turn (it is hoped) will lead reading of larger sections of Greek text (8). So, the question then is, does this book accomplish the intended goal/s? In sum, yes—these goals are met (to varying degrees depending on the reader). This is the pattern throughout the entire book and, in my opinion, is a great plus for this volume. Irons’ organization of the material makes it as easy as possible for readers to find information on a particular text, but also is arranged (akin to the textual apparatus in the UBS5/NA28) in a manner that keeps one element distinguishable from another. It’s also worth noting the useful element found in the back matter—the subject index. Here, Irons provides a list of numerous syntactical elements, all arranged alphabetically. For example, under the group “DISCOURSE STRUCTURE,” Irons includes asyndeton, coordination for subordination, parenthesis, and period. For each of these examples, he provides a reference to a text in which that particular element appears. While obviously not an exhaustive list of syntactical examples, those listed are plentiful and will provide a most helpful guide to locating them in the Greek NT. Doubtlessly, some will disagree with a particular categorization of one thing or another; however, I would be surprised if those disagreements numbered beyond the point at which the book is useful. If that’s the case, then certainly other volumes are available that will meet whatever needs this one does not. 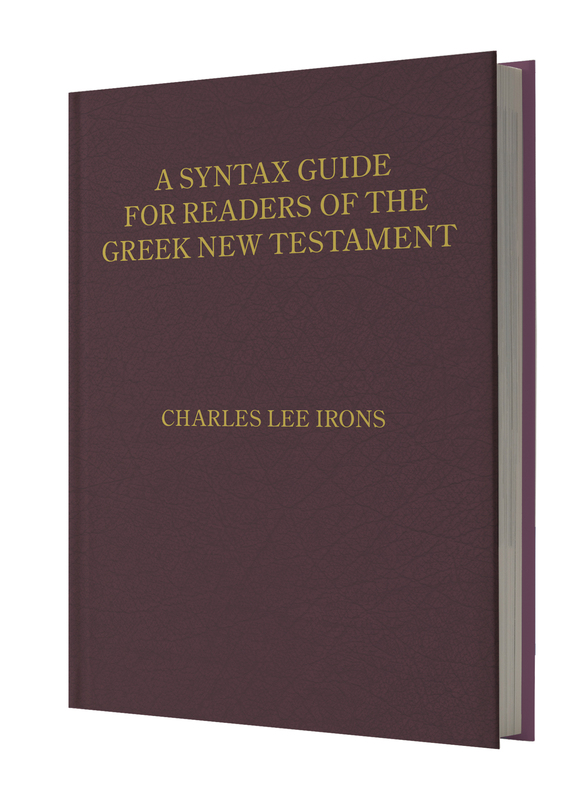 Suffice it to say, Irons has provided a most helpful resource for those looking for something to help them grapple with (and ultimately understand) various syntactical elements in the Greek NT. It will not supplant texts whose design is to be more thorough and exhaustive (e.g., Wallace’s Greek Grammar beyond the Basics; BDF); it will, though, serve as a handy reference to the less intensive task of reading the text. So much can be and has been said about one of history’s most formidable entities. Thankfully, Brian Campbell has distilled some of the critical times and personas that comprise historical Rome into a relatively brief (248 pages) introductory text that not only provides a chronological accounting of the beginnings of Rome, nor merely a discussion of the powers that built, sustained, and ultimately destroyed her, but provides a glimpse into the lives of its people. This was perhaps my favorite element of the book. I enjoy reading purely historical texts for the sake of learning about people, places, and events of the past, but it’s the stories and accounts of the people that make it most interesting—after all, what is history without people? Campbell provides ample references to the primary sources, though some sections are more amply noted than others. There are also a number of diagrams (mostly related to military issues; some are geographical) interspersed and a handful of photographs that illustrate some aspect of Roman life and culture (these are black and white). This has served as an immensely helpful text, not only for getting a bird’s-eye view of the Romans, but also as a quick reference guide. Many times I would reach for this volume while reading something else that made a reference to some aspect of ancient Rome so that I could read a little more about it. Campbell’s book is great for such use—it’s not a cumbersome encyclopedia, but neither is it a miniscule handbook. It finds a middle ground between these two and is a perfect reference for those who need a slightly more detailed account or description than provided in a few general sentences. Also, as a student of the NT and its contexts, I found this book to be quite informative about the various exploits of Rome that had immediate impact upon the world of the NT. In sum, Campbell’s volume will be a great introductory text for readers who want a foray into the illustrious history of Rome—deep enough to inform yet succinct enough to be accessible.